So much for the Android Market. 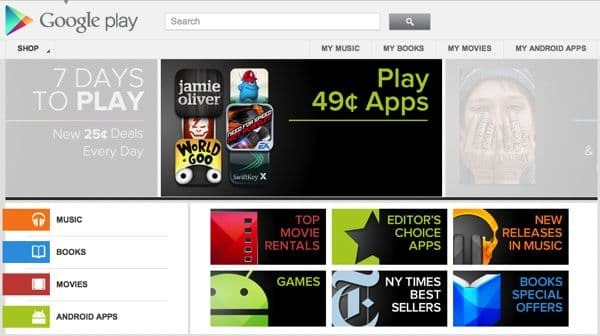 In its place: “Google Play,” Google’s new digital hub for Android apps, games, and media. In a blog post Tuesday, Google said it was consolidating the Android Market, Google Music, and Google eBookstore sites into Google Play to reduce the “hassle” of finding and organizing apps, tracks, videos and books for your various Android devices. That’s the theory, anyway. In practice, Google Play (which you can check out right here) looks an awful lot like the old Android Market. You can still browse for apps just as before, with the main app product pages (like this one) serving up product descriptions, screenshots, user reviews, and buttons for buying and/or installing a given app to your Android device. Up at the top of the Google Play page, just above a rotating carousel of promos, you’ll find tabs for “My Music” (the new home of Google Music), “My Books” (which replaces the Google eBookstore), and “My Movies” (for video rentals and purchases). OK, so what happens to your old apps from the gone-but-not-forgotten Android Market, or your Google Music tune collection? Don’t worry—they’re still there, just where you left them. Indeed, the books and albums I bought from Google Music and the eBookstore are present and accounted for, except now they’re sitting under a “Google Play” banner. Google is also promoting the Google Play launch with daily discounts during the next week; check out this blog post for more details. So, what do you think: will putting all of Google’s Android wares under a single “Google Play” roof make it easier to shop for apps, music, videos and books? Or will you miss the Android Market? Let me know what you think!